Eastland Mall has been a proud member of the community since it opened its doors in 1981. The mall has been the site of some amazing fund-raising events promoting various different organizations throughout the community. 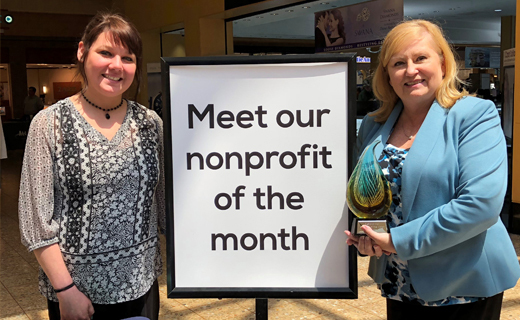 Since 2014, Eastland Mall’s Nonprofit of the Month program has looked to build on that long standing tradition of helping these organizations. The program provides an organization with needed exposure and also helps drive volunteer and financial support. So how does an organization get recognized as Nonprofit of the Month? First, the organization must be a valid 501(c)(3) organization. Secondly, the organization should apply for the recognition by filling out a very simple one page application. Information submitted as part of the application includes what month the organization wants to be recognized and what event/awareness campaign the mall can help promote. What does the organization receive as Nonprofit of the Month? Beginning in 2018, each organization recognized through the Nonprofit of the Month program will receive a Nonprofit of the Month award. The award will be presented on site to the organizations. Photos will be posted to ShopEastlandMall.com and to the mall's social media pages on Facebook, Twitter and Instagram. Each organization receives FREE advertising on the mall's digital message board located on Green River Road that catches 30,000 vehicle views per day. The organization receives a FREE branding ad and a FREE ad to promote an upcoming event/awareness campaign. The organization is also highlighted on a page on ShopEastlandMall.com that gives history about the organization and shares information including how to volunteer and get involved. This page also links to the organization’s website. And finally, each organization has the opportunity to have a tabling event in the mall to sell tickets or promote an upcoming event/awareness campaign. For more information about Eastland Mall's Nonprofit of the Month, please contact Connie Campbell at (812) 477-7171.